Located in the trendy Schanzenviertel district, this hostel is just 2 km from the Reeperbahn and Congress Center Hamburg. It offers modern accommodation with free WiFi access. Nachtquartier features bright rooms with city views. 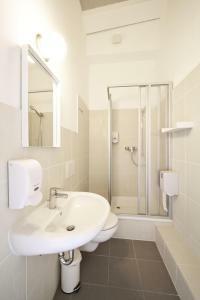 The private bathroom is located in the hallway, and has a hairdryer and free toiletries. Bed linen and towels are included. There are numerous cafes, bars and restaurants serving world cuisine within a 5-minute walk of Nachtquartier. Popular sights include Hamburg Harbour and Miniatur Wunderland model railway museum, both 3.5 km away. The Elbe Philharmonic Hall is also 5 km from Nachtquartier. Sternschanze S-Bahn and Underground Station is 750 metres from Nachtquartier and provides easy connections around the city.